This photo, courtesy of Gallery@Calit2, shows a staged drone crash in front of the campus library. 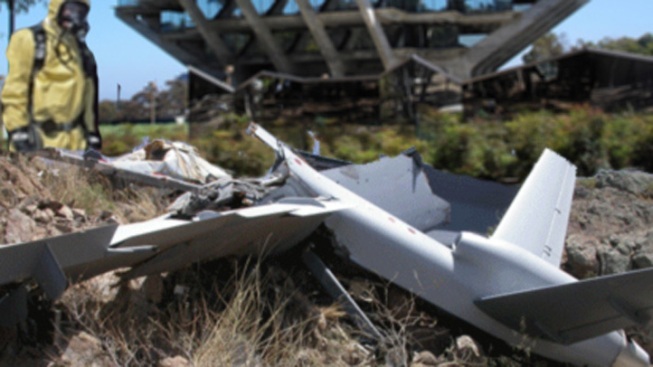 It's a scary and eerie sight: A picture of a small crumpled drone, crashed in front of UC San Diego's iconic library. The so-called UC Center for Drone Policy and Ethics released the picture along with an online statement Thursday addressing a “Campus Drone Incident,” which they say occurred Tuesday. Not only is the center not affiliated with the university, it's not real either. It was created by artists at the university's Gallery@Calit2, a campus art gallery that explores the relationships between art and technology. The statement claims the origin and manufacturer of the crashed drone “remains unclear,” but that researchers at the center will reveal details to the public after a brief presentation Thursday at 5 p.m.
A university spokesperson said they were not aware of the staged drone crash, and that the Center for Drone Policy and Ethics is not real. Both the university and the artists confirmed that the drone crash did not actually happen. The crash is just one part of the gallery’s year-long exhibition, Drones at Home. The artist behind the faux crash, Ricardo Dominguez, is known well-known for his projects, which often play with the mind and blur fact and fiction, said Trish Stone, the gallery’s director and gallery coordinator. "I'm sure some of [the students] probably did think it was real," Dominguez said of the drone crash, "but that’s one of the practices of new media art – what we call minor simulation. It creates an event that is difficult to understand as either real or not real." The drone crash is one of several intended to raise awareness about the future use of drones. For instance, one artist created a drone made of bones to fly over General Atomics, a major manufacturer of unmanned vehicles used for the military. Another artist developed a drone to locate Homeland Security drones and sing borderland songs to it. Though Dominguez himself is concerned about the use of drones and how it may impact peoples' privacy, he said the staged drone crash is more of a conversation-starter than protest piece. "People and students have a chance to have a conversation around the issues about what it means to be living in the 21st century," he said. For information on the meeting Thursday night at the drone crash site, click here.